I’ve hypothesized that the Pacific Decadal Oscillation (PDO) is another one of the complex interlocking emergent mechanisms which regulate the temperature and the heat content of the climate system. I think that's his fancy way of saying that the PDO is an intricate part of the earth-climate system. Well, duh! He also thinks he has 'discovered' an association between the PDO and ENSO. He's right but he's most definitely not the first to do so. ...Finally, this work suggests that predicting the PDO may be directly related to the skill of forecasting ENSO. 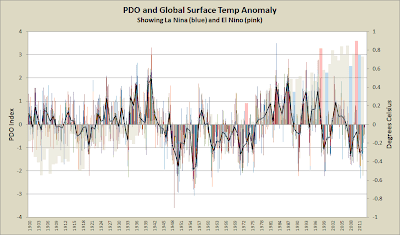 Given the 2-yr decorrelation timescale of the PDO and the possibility that ENSO may not be predictable beyond about 2 yr, so-called regime shifts of the PDO will not be apparent until years after they have occurred. For example, the recent long-term positive phase of the PDO may have simply resulted from the 1977–98 period being dominated by warm events in the Tropics, and the recent apparent ‘‘change’’ in phase of the PDO is an expected outcome of the cool tropical SST in the east Paciﬁc of the last few years. Thus, with tropical SSTs having returned to warm conditions in 2002, the PDO has likewise become positive again. 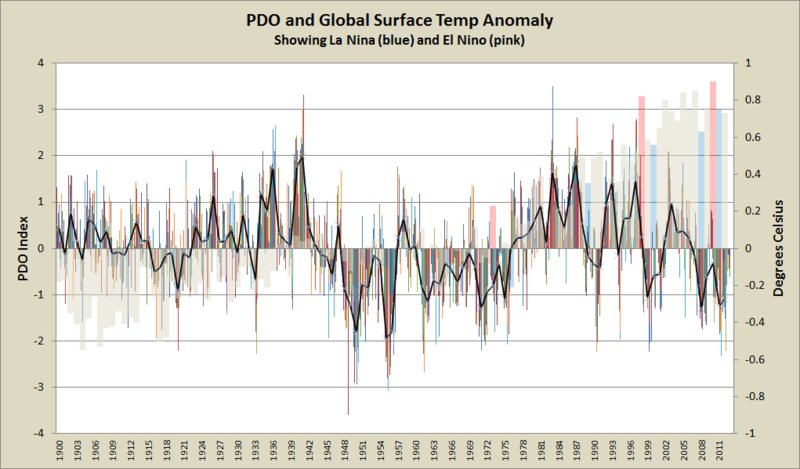 In the absence of a La Nin˜a this year, the PDO may be expected to remain positive in 2004. Incidentally, the PDO did remain positive through 2004. Here is a chart showing the PDO (left axis) and global temperature anomaly (right axis), with ENSO years marked from 1950 onwards. (Click for larger version). Willis also mentions the "Constructal Law" which a quick google appears at face value to be a quack attempt to popularise some airy fairy "unifying" notion or other. The word "Law" in the title is a red flag but am I being unfairly dismissive? Does anyone have any more info on it before I waste time checking it out? PS—This discussion of pressure-based indices makes me think that there should be some way to use pressure as a proxy for the temperature. This might aid in such quests as identifying jumps in the temperature record, or UHI in the cities, or the like. So many drummers … so little time. We use a completely different approach to investigate global land warming over the 20th century. We have ignored all air temperature observations and instead inferred them from observations of barometric pressure, sea surface temperature, and sea-ice concentration using a physically-based data assimilation system called the 20th Century Reanalysis. This independent dataset reproduces both annual variations and centennial trends in the temperature datasets, demonstrating the robustness of previous conclusions regarding global warming. April 8, 2013 at 11:12 am “…to investigate global land warming over the 20th century. We have ignored all air temperature observations and instead inferred them from”… (indirect measurements of secondary phenomena). The exact OPPPOSITE of empirical science! I’m surprised they didn’t mention the Tea Leaves or Tarot Cards. Deniers are a peculiar mixed bag of odds and sods. As I've said before, if people like Willis Eschenbach spent less time wondering and more time building on the knowledge of others, they might actually contribute something worthwhile instead of adding to the confusion of disinformation that is the bread and butter of WUWT. I tried to find out more about the constructal law myself and it doesn't look like more than a description of what happens in some systems. I don't see much rigour. I'm sure that the idea is developed a bit more than a fairly content free fortune cookie statement (I was about to quote it but the more I read it the less I like it). Google did give me some earlier WonderWillis at WattsUp hits so he clearly likes it. It sounds like an engineers solution ignoring physical complications but I could be wrong. Anyway, I have started to notice the ephemeral nature of all these climate change falsified claims. They are like adult mayflies. All over in one day... Next? I looked it up in Google scholar. A lot of the papers were by the person who invented the concept but there are quite a lot of others using it as well. He got published by the Royal Society. For a finite-size flow system to persist in time (to live) it must evolve such that it provides greater and greater access to the currents that flow through it. Sounds a bit like what I learnt decades ago about stream flow / river development though looking at it from a different perspective. I'll leave it alone for now - something for people who deal in flow mechanics to work with. I spent some more time looking at this "law" and I can't make up my mind. It feels a lot like, but isn't, Rupert Sheldrake's morphic resonance idea that is totally pseudoscience (he'll probably now track us down here and give us a hard time). It just doesn't feel as if it actually tells us anything new - trivial, in Feynman's term - rather like the anthropic principle, in my opinion. I found a handful of critiques through Google. One that was upset because Bejan didn't support intelligent design (which was perhaps a little odd because I found a review paper by Bejan which references Simon Conway Morris, palaeontologist, who certainly does support a form of intelligent design). One review of Bejan's book applying his law to evolution didn't like the way the author seemed rather aware of his own importance and I am not mad keen on the way so many of the papers on the subject are, 1, authored or co-authored by Bejan, and, 2, so many of them being applied to so many different fields. In fact anything seems fair game for the application of this law. My gut feeling, for what it's worth is that we won't be talking about this law in fifty years. I'm always wary about ideas that make so many claims. And I wonder how it fits in with what we already know in areas like natural selection and genetics. I always think it is not for the discoverer to say whether it is a scientific law or not - utility and replication surely have something to say about that. That's hilarious no whey constantly shoot each other down. Reminds me of the two camps of creationists in the 80's. Archaeopteryx is CLEARLY A BIRD!!! It has no dinosaur features at all! Archaeopteryx is CLEARLY A DINOSAUR. Those feathers are fake! Evolution is really my field of expertise so it is interesting to see someone else come up with what I have long believed - climate science deniers use the evolution deniers playbook almost down to the letter. I had a search and found a site that listed eighteen pages worth of Willis's wonderings, 180 posts at WattsUpWithThat mainly. That's an awful lot of ramblings and phoney formulas. There was a convergence between the evolution and climate change deniers at Watt's fever swamp last week on the Greenland ice post that Willard flushed down the memory hole. There were several posts made that were made by obvious young earth creationists, and that may have been one of the reasons that post vanished without a trace. John Byatt is on top of the creationist/climate science deniers. He posts a lot at WatchingtheDeniers.wordpress.com. I've been in the creation-evolution eternal flamewar for over (ouch) twenty years now. Not only do the two groups use the same playbook, it is often the same people doing so. Two of the best kniwn, and probably also largest, creationist groups are the (young earth) Institute for Creation Research and the (intelligent design creationism) Discovery Institute. Both are also in denial about climate change.